There are NO ADS, just quality information about this wacky world of ours. The kids love it! Short, informative articles on history, archaeology and nature educate the kids without them realising it! You will be surprised at how much they learn. 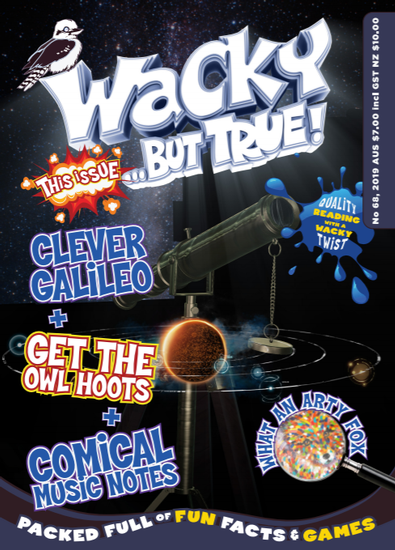 It is aimed at kids aged 8-15, but even adults say they love reading this mag. It's good clean fun - and it's all true! A year's subscription is $69.96 for 11 information-packed issues PLUS free access to the online magazine. Suitable for girls & boys aged 8-15 years. I bought a 12 month&apos;s subscription for my grandson&apos;s 9th birthday. he loves it and looks forward to the next one coming into his letterbox.